We love a bit of Shakespeare and we love outdoor performances of the Bard’s work. And what better than the fabulous romp, A Midsummer Night’s Dream. 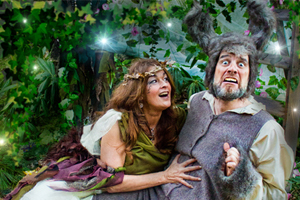 Award winning MATE Productions in partnership with Shakespeare North and the RSC Open Stages programme present this spectacular promenade indoor and outdoor production, premiering in the beautiful 15th century church and woodland gardens of Prescot Parish Church, and touring woodlands and community gardens across Knowsley, Liverpool and Stratford Upon Avon between May – August 2015. Gaynor La Rocca, Artistic Director of MATE Productions is working with Shakespeare North to develop and lead their community engagement and is launching the programme in the summer of 2015 with this exciting three way partnership between MATE Productions, Shakespeare North and the Royal Shakespeare Company. Over 100 local community actors, dancers, musicians, singers, sewers, crafters and volunteers aged 8 – 79 years have been working for the past 7 months with MATE Productions’ team of professional practitioners; including theatre designer Adele Hayter, winner of the Liverpool Everyman and Playhouse Design prize 2014, musical directors and composers Aimee and Taran Harris, choreographers Alan Pugh and Rachael Farrell, and practitioners from the Royal Shakespeare Company, to create this magical outdoor promenade performance of Shakespeare’s most loved comedy. With live musicians and singers, fairy dancers, stunning design and a talented local cast, this production promises to be magical, unique, family-friendly and fully accessible for wheelchairs. Community engagement also includes an exciting programme of free arts and craft workshops in local schools where children will make dream catchers and magical artefacts to hang on the trees and transform the woodlands into a midsummer’s fairyland. Families are encouraged to bring their children to performances dressed as flower fairies or naughty sprites. There will be facepainters before the show and during the interval and children can choose fairy flower designs or the tribal markings of a sprite. Seating in the woodland in Prescot and Halewood will be on hay bales or bring a blanket. For other venues, please bring a folding garden seat or a blanket to sit on. Don’t forget waterproof clothing in case of rain – please no umbrellas as it will obscure the view for other audience members.